Released on 25th May 2012, My Divine Self is an inspirational story revealing spiritual insights that could transform your life. An unusually good read that will warm your heart. 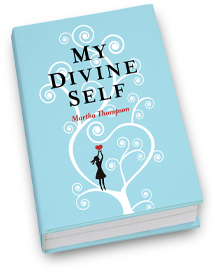 My Divine Self is an inspirational story that will strike a cord with anyone who reads it. It holds the key to awaken your heart and mind to a new way of thinking. Martha in an opening letter reveals to you she has spiritual insights that could help you overcome life's challenges. Those moments in life when you feel like you are sinking in quicksand. She asks that you remain open minded and pass on these spiritual insights to help others. Martha then transports you to a moment in time when she was plummeting to the depths of despair. She hears a voice that tells her to get a grip. She is baffled. Why didn't that same voice stop her from making all those bad decisions? and where is it coming from? A dialog develops and Martha starts to get answers to questions that need answering. Hold Martha's hand as you journey through the pages and like her you will feel like a phoenix rising from the ashes of your former self. This book could transform your life. Are you ready? My Divine Self is available from O-Books, Amazon, WHSmith, Waterstones and many other book outlets. Paperback: £9.99, E-book: price may vary. Martha Thompson writes to stir up inner reflection to aid personal growth and self healing. She is a teacher, therapist and medium. Inspired by her own guide called Ellis. Martha Thompson was born in the West Midlands. She is a teacher, Colour therapist, aromatherapist, spiritual healer and Medium. She has written several articles on colour therapy. Martha also run workshops and gives talks. She lives in Hampshire in the UK.